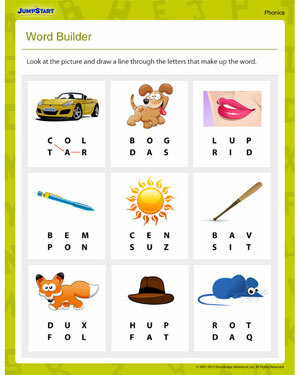 ‘Word Builder’ is a fun and printable phonics worksheet for kindergarten. Students must identify each picture and then draw a line through the letters that make up the word. ‘Word Builder’ can be used to help kindergarteners practice sounding out letters to spell words. With simple consonant-vowel-consonant words, this worksheet is great for reading practice for beginners.